The Midland-ACS IMPACT is a high integrity modular pneumatic actuator control assembly in 316L stainless steel, used for the control and sequencing of process valve actuators on oil and gas platforms/pipelines. Whether it be a standard shut off circuit or an intricate control system, IMPACT can be tailored to meet the requirements of your project. Lighter, stronger and more compact than panel mounting, IMPACT offers a significant reduction in total installed cost in both OPEX and CAPEX over panel mounted assemblies. Smaller footprint, compact and lightweight, the modular system does away with complex arrangements using panels, pipes and additional fittings. 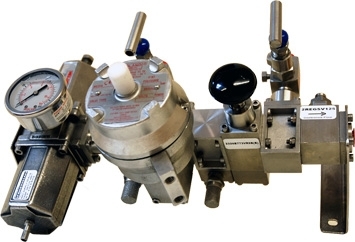 Using a range of field proven components, valves (spool, poppet or direct acting) and filter regulators are connected in series using a universally compatible interface block and mounted directly onto the valve actuator. Each unit is supplied assembled and tested, ready to fit and operate. No design work is required from the contractor and all components are kept in stock resulting in very short lead times. IMPACT components are ideal for both hazardous areas and industrial use, with ATEX approval. Units will interface with all global pneumatic actuators. Rotork Midland has over 50 years experience in the manufacture of stainless steel and pneumatic components. That wealth of experience has resulted in a range of field proven specialist products renowned for their performance and reliability. Simple auxilliary removal - tanks, gauges etc.